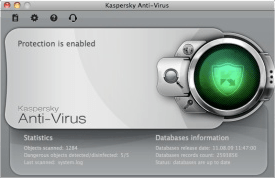 Kaspersky® Anti-Virus for Mac has been developed to meet the specific security requirements of Mac users who know the value of the data stored on their computers, along with the need to keep them running smoothly. As one of the most successful specialist software security companies in the world, you can trust Kaspersky’s award-winning technologies to protect your music, photos, files and sensitive information, and prevent you passing malware threats on to friends and colleagues when exchanging information with other types of computers. Kaspersky® Anti-Virus offers signature-based protection from all known types of threats including viruses, worms, Trojans and bots. Files are scanned when opened, downloaded or saved, restricting access to suspicious files and disinfecting them whenever possible. Kaspersky® Anti-Virus protection is not restricted to threats against files, music, photos and personal information on your Macintosh; it also defends against the 30,000 new threats that target other types of computers every day, preventing you from passing problems on to friends and colleagues. Kaspersky® ensures your security is completely up to date without you having to lift a finger. Updates containing protection against newly identified threats are distributed daily (or more often if required) and your Kaspersky® software is automatically updated to the latest versions as they are released. All files downloaded from the Internet are checked against malware. All identified threats are blocked and accompanied by an alert. Your email messages and their attachments will be protected by real-time scanning. As threats are identified they will be blocked and you will receive an alert. It's important to know that Kaspersky® Anti-Virus for Mac is more than capable of protecting itself. 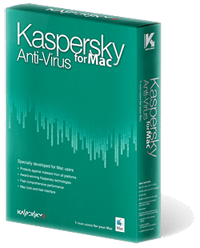 Kaspersky® Anti-Virus for Mac uses a variety of techniques to ensure that protection cannot be modified or deleted. Password protection also prevents people or malware from disabling or making changes to your antivirus settings that could leave your Mac more vulnerable to attack. Familiar Mac-style interface makes Kaspersky Anti-Virus for Mac highly intuitive and user friendly. Kaspersky® Anti-Virus for Mac delivers award-winning security levels while consuming less than 1% of processing power. Technical support from qualified technicians via telephone and email. Kaspersky® Knowledge Base - an online database of detailed answers to questions about installing and using Kaspersky Lab products. 30,000 new malware threats that emerge every day, so you don't pass on problems to friends and colleagues using non-Mac computers.